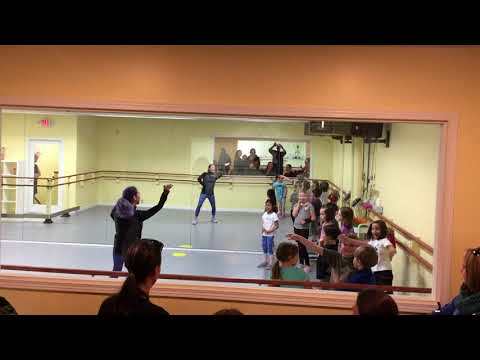 Kid's Hip Hop Dance: About this photo-American Dance Institute's Moira Bugler is leading one of her popular kid's hip hop classes in Hip Hop Dance Studio #2. In addition to the class offerings here, American Dance Institute offers teen hip hop classes, hip hop classes for kids ages 8-14, and adult hip hop classes. Kid's Hip Hop dance is now. It has entered the mainstream dance culture. Our kids, teen and now adult dance classes are swelling with eager students. If this is your child, we will teach them the best elements of this fun, stylish and forgive us, 'hip' dance style. FITNESS: Kid's Hip Hop dance classes are easy to dismiss as just a fad dance. However, to learn and execute dance moves requires a very strong set of core muscles. Your child will be receiving substantial physical training in every class. All the kids know is that they are having fun. We start with a thorough warm up and begin to build your child's core strength and improve their body control. We introduce the latest funk and hip-hop moves, followed by lots of choreography to develop the expressive abilities of the dancers. We observe that after learning just a few moves, a child's confidence and enthusiasm rockets. FAMILY FRIENDLY: And of course, we play only clean music selections that are always family friendly. Instructor Jazerelle Kellough leading our first hip hop class for kids in Shoreline WA. This is the kid's first dance class. The vantage point is our spacious Shoreline viewing room where parents can sit in comfort and watch their kid's progress in class, catch up on reading, or relax and enjoy the show. This schedule includes brand new classes and continuing Fall classes. No need for expensive dance costumes or outfits at ADI. Children can wear comfortable or loose fitting dance clothes and dance sneakers or clean sneakers that are only worn inside. Kids have to be in shape to execute the demands that dance places on their bodies. The kids in this video clip of American Dance Institute's beginning hip hop class for kids with instructor, Jazrelle Kellough, demonstrate the fitness training that is incorporated into each class, including stretching. We offer kid's hip-hop dance instruction at all three of our studio locations, including our newest studio in Shoreline WA at 1240 NE 175th Street, Shoreline 98155. Call 206-402-6561 to learn more. Jazrelle Kellough trained at the Pacific Northwest Ballet for 8 years as well as training with Alonzo Lines Ballet in San Francisco, Houston Ballet and Ballet Austin. She has performed in A Midsummer Night’s Dream, Coppelia, The Nutcracker and Snow White. ​After her years of classical training, she began studying hip-hop at Westlake Dance Center and is choreographing for D&G dance and other open doors around the greater Seattle. Jazrelle joined American Dance Institute in January of 2018.